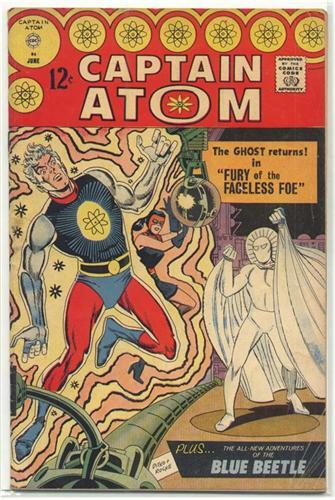 story: "The Fury of the Faceless Foe"
Captain Atom & Nightshade have a rematch with their untouchable foe, the Faceless One -- aka, the Ghost! VG : excessive creasing bottom right (up to about 2"), 1" tear center bottom edge, a couple of 1/2" blemishes center spine, light wear along top edge, large crease across top back corner, sharp 3/4" creases top corner (front & back), moderate spine stress & handling overall. Complete, tight to staples (opens flat), good gloss, light tan pages with light corner wear & 2-3" publishing wrinkles at top margin front pages. Image of actual item shown. Bagged & boarded.